What I Learnt From... Taking Part in an Anthology. Guest Post by Kate Field. This week, I am delighted to welcome Kate Field to my blog. Kate is the author of The Magic of Ramblings and The Truth About You, Me and Us, both of which are contemporary romance novels about relationships and romance, and both of which I highly recommend. I enjoyed The Magic of Ramblings so much I named my cat Cassie after the heroine! 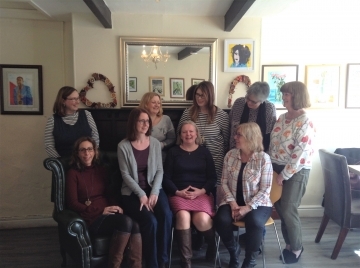 For the last couple of years, I’ve been a member of a writing group called Authors on the Edge, made up of romantic fiction authors from across Yorkshire and Lancashire. 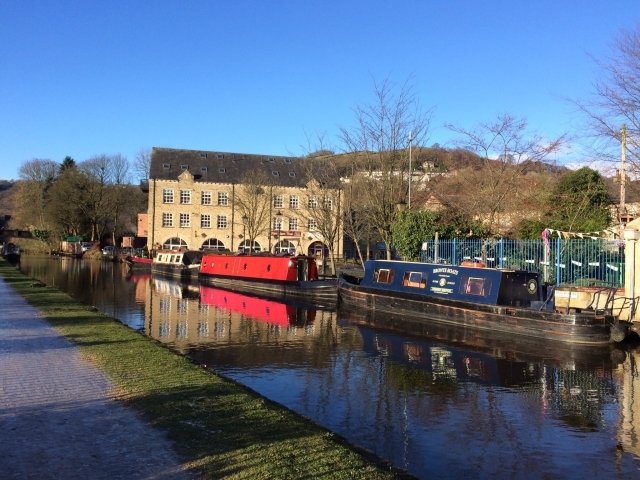 We meet several times each year in Hebden Bridge, a pretty Yorkshire town close to the border with Lancashire, to have lunch, catch up on writing news and to cheer and comfort each other as needed. I couldn’t believe my luck when I was asked to join: the other members are a hugely talented bunch, and include Mary Jayne Baker, Sophie Claire, Jacqui Cooper, Helena Fairfax, Melinda Hammond, Marie Laval, Helen Pollard and Angela Wren. Over lunch last summer, Helena asked whether we’d be interested in joining together to produce an anthology of stories. Everyone loved the idea and the theme was swiftly settled: we would write about a mysterious character called Miss Moonshine and her quirky shop, where people found what they needed rather than what they wanted. That was the easy part – then we had to write the stories and put it all together in a book! 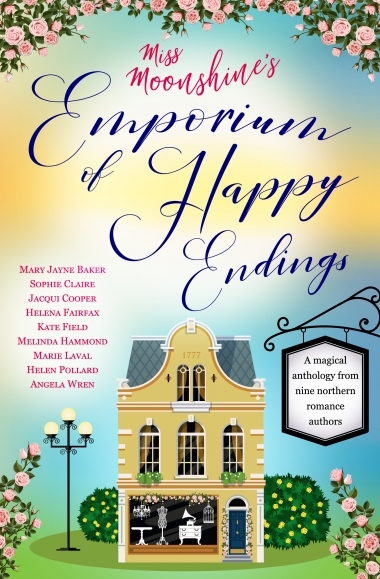 I’m delighted to say that we’ve done it and as I’m writing this, we’re looking forward to publishing Miss Moonshine’s Emporium of Happy Endings on 18 May. The book cover is crucial. It’s an obvious point, but I’ve never seen the effect of it before. We were incredibly lucky, as Mary Jayne Baker is a graphic designer and she produced our cover for us. It’s absolutely gorgeous! The anthology became a bestseller on Amazon within a week of going up for pre order, and I’m sure the cover paid a large part in that. I can write outside my ‘comfort zone’. So far, I’ve only written full length novels set in Lancashire, so it felt quite a challenge to be asked to write a short story set in Yorkshire! I also found it difficult at first to write about a character that I hadn’t invented myself and spent time developing. Having said that, I came to love Miss Moonshine and now I’ve read all the stories, it’s remarkable how we have all written such a similar character! Even in a joint project, I need to find my own ‘voice’. My novels tend to be character-driven rather than plot-driven, and I struggled for a long time with how to develop the characters as I wanted to, in roughly one tenth of my usual word count. There were a couple of times when I didn’t think I could do it and wondered whether to drop out, so I didn’t spoil the anthology with a rubbish story. Even when I made it to the end of the first draft, it didn’t feel right, but I couldn’t say why. Then, after putting the story aside for a while, I realised what I should have done with it from the start. I made some changes and I knew immediately that the story now sounded like ‘me’. It was a huge relief! One of the things I love most about the anthology is that I can hear each individual author’s ‘voice’ in their story, even though we were starting from the same idea. I’m not good at sticking to word counts. We were supposed to aim for 8-10,000 words. Mine weighs in at over 11,000. I gratefully accepted Helena’s advice: a story is as long as it needs to be! It’s much easier to promote an anthology. I hate doing ‘buy my book’ type posts on social media. ‘Buy our book’ posts don’t seem anywhere near as pushy, as I can convince myself I’m doing it for the other authors! It’s always an anxious time waiting for reviews to arrive on a new book. I didn’t think it could be more nerve-wracking, but now I’ve found it can be! I live in dread of the reviewer who loved all the stories except mine. I would hate to let the team down. Self-publishing isn’t as scary as I thought it would be. This is largely thanks to the members of Authors on the Edge who have self-published before and know what they are doing! But it’s been good to be in control of every detail: the blurb, the cover, the marketing strategy, the timing of publication… Everything has been done the way we wanted, when we wanted, so it really feels like ‘our’ project. A committed group of writers can knock the socks off many publishers when it comes to preparing for publication. Thank you for this lovely comment, Jen. I hope you enjoy reading the Miss Moonshine book. I know your copy has arrived on your Kindle. I'm not sure of the time difference, but I think you received it a little earlier than those of us this side of the Atlantic. And yes, it is a truly beautiful cover. So appealing. Such a lovely post, Kate. I've pre-ordered 'Miss Moonshine' and am very much looking forward to it popping up on my Kindle later this week. I enjoyed hearing about your experience of 'writing short' and also contributing to this kind of analogy. It sounds as if you learned loads and had great fun too. And oh yes, that gorgeous cover! Hi, Suzannah. I'm sure lots of readers would love a paperback copy of Miss Moonshine. It sounds like it would be a lovely present to give. And who can resist that cover illustration?! Great minds think alike, Jan - I have just visited your blog and have come here to find you have visited mine! I'm glad you enjoyed Kate's post. And yes, it is a gorgeous cover illustration, isn't it? What a fabulous post, Kate and Susanna. It sounds as if it was a fun project with an excellent anthology as a result of it. I can imagine how proud you must be to be part of the group and you certainly have learned such a lot from the experience. I love the cover! Now there's an idea, Kirsten - an LLs' anthology! What a great idea. Glad you enjoyed Kate's guest post. I hope you enjoy reading the Miss Moonshine book. It sounds lovely. I adore the cover, and I'm not surprised it has contributed towards the fab pre-order ranking! Great post again, Susanna! Love the concept!